Strikingly modern, without compromising the mystical essence of this Indonesian island, Samabe Bali Suites and Villas are known to offer fantastic luxury facilities. 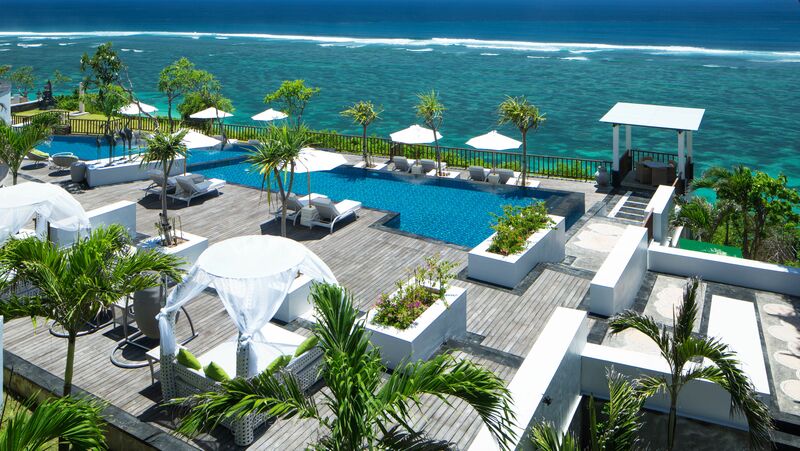 This 5-star hotel complex is located on a majestic cliff where you can take in views of southern Nusa Dua’s spectacular ocean and rainforest landscapes. Take the one-minute walk down to the hotel’s exclusive beach, and enjoy signature activities such as charter boat tours and cave dining, or simply relax on the golden sands. Both couples and families can look forward to enticing cuisine, interactive cultural activities and enriching wellness experiences, all inspired by local traditions and ancient hospitality practices.Besides crafting delicious seafood dishes and cocktails, Samabe’s poolside restaurants and bars boast terraces for unforgettable al fresco dining occasions. Hotel child prices apply to ages 4–11 years. This luxury accommodation offers standard benefits that include daily breakfast and afternoon tea, as well as unlimited non-alcoholic drinks. The unique benefits of the all inclusive “Unlimited Privileges” package include signature activities, spa treatments, premium meals and beverages, a 24-hour butler service, and more. Also known as Rempah², the hotel’s main restaurant on top of Nusa Dua’s cliff not only spoils you for choice with an array of Balinese, Asian and Mediterranean dishes, but also offers beautiful panoramic views. The dress code is smart casual. Rotating themed dinners are hosted twice a week, offering either Japanese, Chinese, Indian, Indonesian, Vietnamese, Malaysian or Mongolian cuisine. 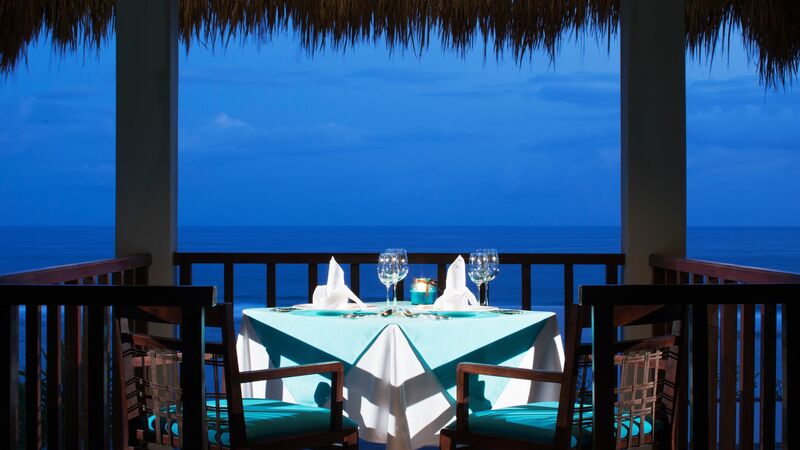 Whether you opt for al fresco or indoors, à la carte or fine dining, experiencing this restaurant's exceptionally fresh Mediterranean cuisine proves why it is one of Nusa Dua’s favourites. 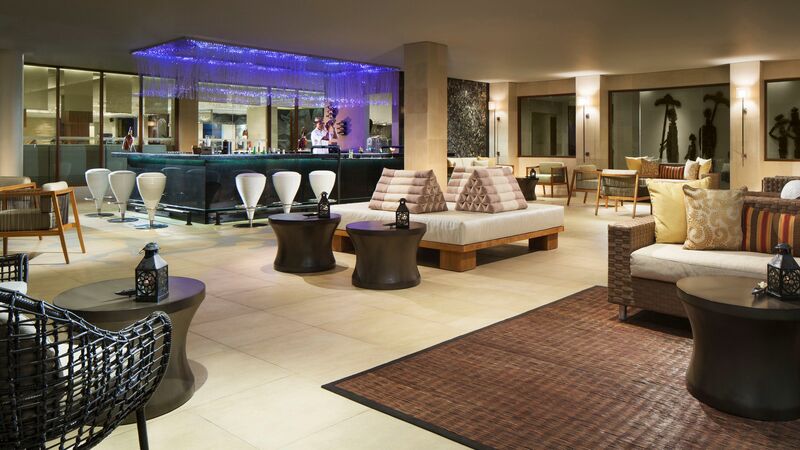 Delight in traditional Indonesian herbal drinks and coffees in the hotel’s modern, Asian-inspired lobby bar where you’ll find relaxing wicker sofas and a refreshing selection of cocktails, beer and wine served from 17:00. The hotel’s poolside bar and al fresco lounge will sweep you off your feet - especially at night when fire torches spark romance! Exotic cocktails, premium brand spirits and snacks are served. Feel like absolute royalty when you head to Samabe Bali Suites & Villas’ beach cave for this unique tea time experience, complete with sandwiches, scones, desserts and a glass of Balinese champagne. Combine fine cuisine with true comfort as your butler personally delivers a variety of freshly prepared Western and Asian dishes to your luxury suite or villa. There is no better way to admire the breathtaking ocean views than from the hotel’s infinity pool. Fresh juices and light meals can be enjoyed as additional treats. The hotel’s secluded beach is surrounded by lush rainforests that enhance the tropical beauty of this Balinese beachfront. Enjoy active mornings of water sports and lazy afternoons soaking up the sun. Beach attendants are also available for assistance. The hotel’s experienced staff provide younger guests with countless opportunities to create holiday memories to last a lifetime. 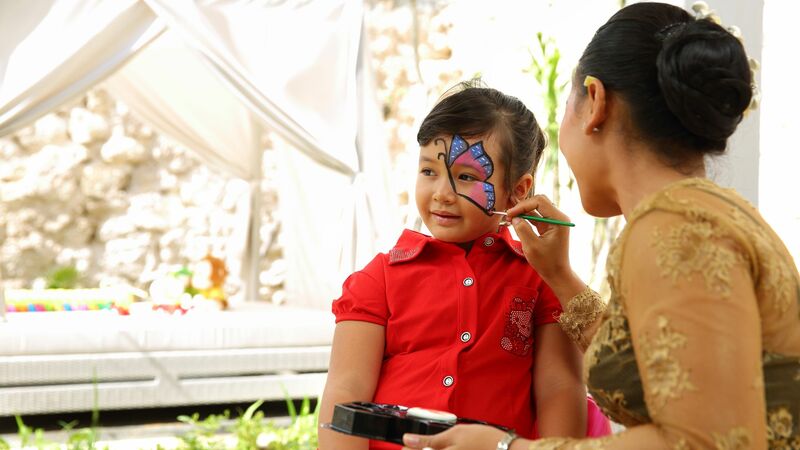 Activities include educational temple visits, water sports, Balinese dress-up, origami-making and face painting. Ages: 2 – 8 years. No reservations are necessary. Babysitting services may also be arranged. 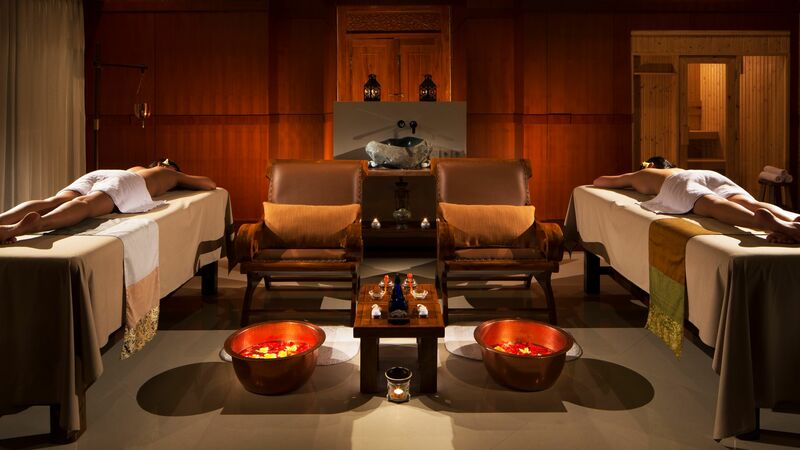 Celebrate the serenity of your surroundings by immersing yourself in a rejuvenating spa experience. The soothing scents of candles and an outdoor bathtub filled with flowers offer the ultimate indulgence. 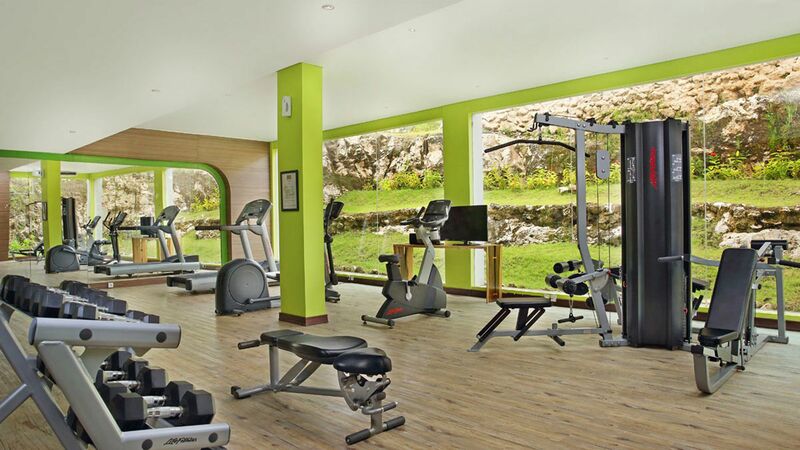 For your convenience, the well equipped gym has an indoor and outdoor track, as well as group activities with exceptional views and yoga sessions on Samabe’s beach. Private yoga lessons are available at an additional charge. While catamaran sailing on the warm waters of the Indian Ocean is a highlight in its own right, the charter boat ride around the island is not to be missed. 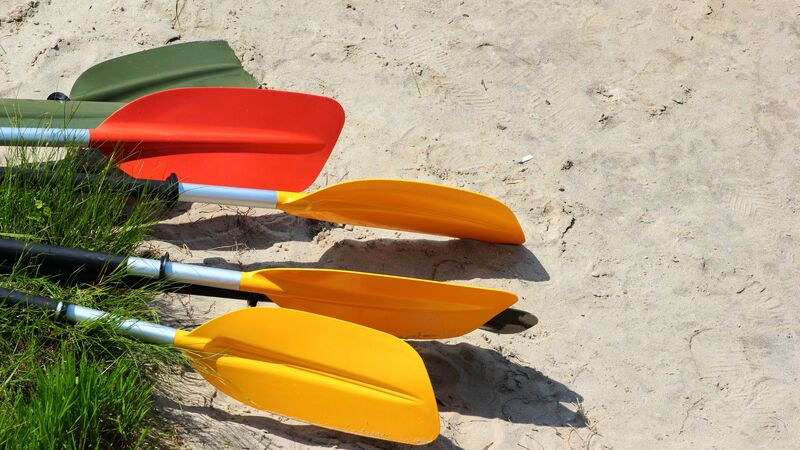 You can also enjoy complimentary non-motorised water sports, such as fishing, kayaking, snorkelling and windsurfing. Satisfy your curiosity by learning about the rich flavours of Balinese cuisine and the movements of traditional dancing. Also offered are Batik painting and fruit and wood carving lessons. "Timeless by Koza" is a boutique and drugstore located on the hotel grounds to offer you direct access to unique souvenirs and gifts you won't find anywhere else in Bali. As part of Samabe Bali Suites & Villas’ exclusive “Unlimited Privileges“ package, you can enjoy exhilarating activities such as a romantic cave dinner, sunset tour to Uluwatu, sea-walker adventure, and in-suite massage treatments. After many years of acclaim, beautiful Bali remains a favourite for tropical honeymoon retreats and family adventure trips. 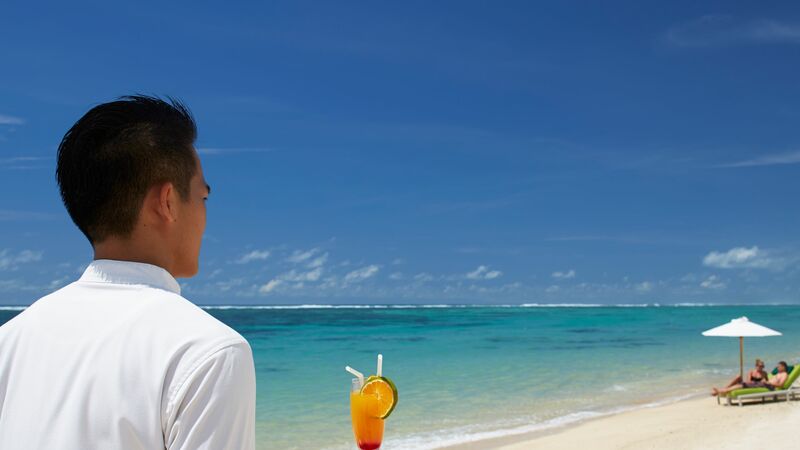 The southeastern coast where Nusa Dua is located, does the island justice with its wealth of beachfront activities and fine dining restaurants, as well as the Bali Collection shopping complex. This area is also well-known for its pristine beaches and gentle Indian Ocean waves, and the ‘hidden’ Pandawa offers the perfect introduction to idyllic afternoons in paradise. For a change of scenery, take a day trip to Batubulan to watch captivating Barong performances, or to Kuta’s Waterbom park for family-friendly fun. If local art interests you, Museum Pasifika is an eye-opener to the expressive nature of the rich Balinese culture. Samabe Bali Suites & Villas is less that 30 minutes from Bali Denpasar Airport. Located on the second and third floors of the east and west wings of the hotel. The suites feature a spacious bedroom with king size bed, dressing room and en suite bathroom with bathtub and separate shower. There's also a comfortable living room with dining area, powder room and a balcony with daybed and stunning ocean views. The Family Suites are the same as the Samabe Suites, however feature two queen size beds. Located on the first floor of the east and west wing with a private pool and garden. Outstanding views of the ocean over Balinese thatched roofs. The villa offers lots of space with a bedroom with king size bed, living room, bathroom with bathtub and separate shower than can be accessed from the garden, a terrace and a private pool. Save up to 5% discount on the hotel price booked 65 days prior to arrival for holidays between 01 November 2018 - 31 October 2019. Guests staying for a minimum of 5 nights receive a free entrance to the Devdan show at the Bali Nusa Dua Theatre every Monday, Wednesday, Friday and Saturday for holidays between 01 November 2018 - 31 October 2019, please call our trusted advisers for details. Stay for 6 nights and pay for 5 nights or stay for 12 nights and pay for 10 nights when staying in a One Bedroom Ocean Pool Villa for holidays between 01 November - 20 December 2018. Please note not all offers are combinable, call our trusted adviser for further information. We have spent 4 nights here, celebrating my Wife?? ?s (significant) Birthday before joining a cruise to Singapore: - how do all the staff know your name? - how do all the staff know where you had dinner and ask how you enjoyedit? We are well travelled and have stayed in the best hotels, Regent Beverley WIlshire, Burj Al Arab, Versace in Oz but none have come close to the service we recieved here. It is a family hotel and we normally do adult only but there is enough space at restaurants, beach and pool to make it feel like adult only. The children here are much better behaved than U.K. or USA kids anyway. The food is amazing. Special mentions to Dee (you know why Dee), Kris, and Billi who met us at the airport and is taking us to the ship shortly. All I can say is that if you choose here as your home in Bali, whatever your circumstances, you will have the trip of a lifetime. I almost feel confident enough to offer a money back guarantee. We stayed in a Honeymoon Pool Ocran View Suite, it was ample sized and very private (112 East) - perfect. Thank you Samabe for making my Wife?? ?s Birthday very special! What to say, this place is truly mind blowing. When we arrived into Samabe, we felt as if we stepped into another world. 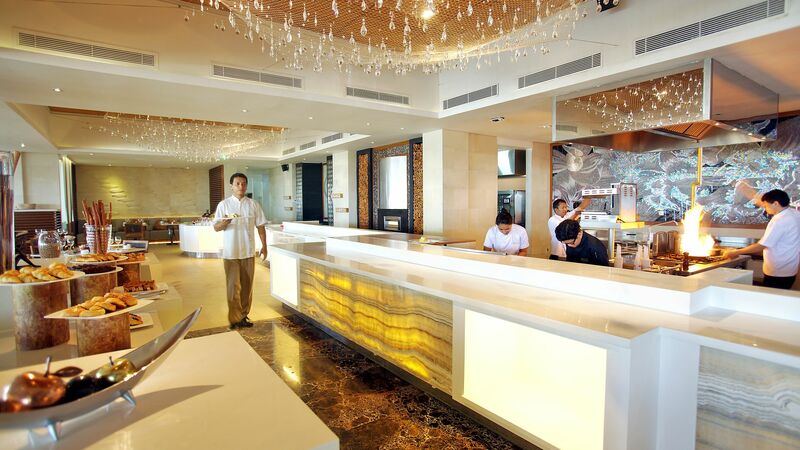 The staff are extremely friendly and we were even provided our own personal butler upon arrival. The resort itself is situated on a cliffside of the southern most part of Nusa Dua next to a pristine (and private) white sand beach. The atmosphere here is serene and we loved the sense of privacy we felt at all times. Best Advice, don?? ?t miss tea time at the beach! Champaign, snacks, and chocolate fondue! Perfect. And later in the evening you can have a private dinner in a cave on the beach, where else can you do that?? The gym is clean and they even have a ping-pong table which was a good way spend an hour after laying out by the pool all day. Breakfast was great as well, Large buffet, many options to choose from. My boyfriend and I had an amazing time here in our villa by the sea. A perfect get away for couples or families. We will definitely be back! My wife and I recently celebrated our 5th wedding anniversary in Samabe and it was an incredible experience. We stayed in their One Bedroom Pool Villa which was magnificient - spacious and elgantly designed with quality furnshings. The pool was great and we had a good view of the ocean. Their service is impeccable - starting from check-in, to ease of transfers from room to either lobby or beach with their buggy service, and room service. Their butlers were very attentive and making sure we were always taken care of. I would encourage Samabe to perhaps consider increasing the variety of their breakfast spread to avoid boredom - but otherwise I really cant fault them. My wife and I are busy doctors and really needed a break where we are pampered, taken care off and well fed. We got this and so much more in Samabe. Travel Tips: 1. Nusa Dua is at the southern tip of Bali. If you are looking for more of a hustle-bustle/party scene, you are better off staying in Seminyak/Kuta. The travel time with Bali traffic is 1 hour each way. 2.Snorkeling in Samabe offers very little underwater life to see. Its not a spot for snorkeling although they offer it as an activity. “ Honest review for Families w children thinkin to stay in Samabe. I had a great time as villa was nice w gorgeous view, tt is if u managed to get one w unblocked ocean view. Staff were accomodating when i wanted a villa change as our view was almost fully blocked despite being an ocean villa which we paid more for it. Mgr Yumi and butler were really accomodative for a change of villa, n they made it seamless. Howeva, 1 impt pt to note: there is a Monkey tribe over at e villa. Doesnt sound serious, n cld be a treat to look at. Thats exactly wat i thot, juz dun feed e monkeys n not look em in e eye n ure ok. Howeva it really isnt e case. One morn, i was doin yoga by e beach, e monkeys starting comin together behind us, thk goodness e gardeners tried to shoo em away every 5-10 mins. But becuz of tt, it was really disruptive cuz 1) i was wary of e monkeys as they were all behind us 2) everytime u hear shh shh u noe e monkeys r ard. So wat was supposed to be e super zen yoga kept me n e guests constantly turning behind to check out if e monkeys r menacing ard. I ve 2 young kids, 3 and 5 years old. 3rd day, my kids were in e pool n had a pkt of unopened cereal in e bag. Me n hubs were havin e wonderful foot reflex by e pool when sudd one of e stff started screamin, 1 monkey rummaged thru our bag n got e pkt of unopened Kellogg cereal n e rest of e tribe started coming. Thk God, kiddos were in e pool. Next evening, my kids wanted to take a pic w e old jeep by e lawn. (Monkey tribes r out as a gang in e afternoon n early evening- its always e same gang) My 3yo was holding a small pkt of cereal taking a nice stroll when we sudd saw few monkeys n i shouted to keep e cereal away. My husband tried to shoo e monkeys away as they were gettin more n comin close to us as a gang. The rest then went away except for 1. He muz be e Alpha, he challenged my husband n hissed at my husband, n while my hubs was tryin to protect us, we were tryin to back off when e monkey continued to showed his teeth n taking steps to wan pounce on my husband. I was freakin out as i was also tryin to protect my 2 kids!! I let out screamin for help n thkfully a buggy passed by, n a guy stepped out n tt was when e monkey backed off slowly still hissing at husband. Of course, it was prolly a threat of territory perhaps. But it was supposed to be an extremely relaxin place yet it turned out to be pretty stressful. I had to be wary cuz of my kids, n this incident really stressed me out. It cld ve pounced onto my husband n gash thru w their sharp fangs onto hubs. They can be really aggressive. In fact, thr was also a day whr we had food at our balcony, n as we walked in e villa n left our food thr, e monkeys started to spill e drinks n food so they cld eat it. Housekeeping was quick to react when i called. Though this incident had no faults of Samabe, howeva i personally think this is a safety issue for guests. And e property shd think of ways to keep them away as they can be v menacing n it can be a safety issue esp for young kiddos. I do acknowledge this is nature, howeva it is e same monkey tribe tt visits e property all e time. It juz takes 1 bite, n someone cld be bleedin away. I luved e villa n stff,but e experience was a lil turnoff by all e incidences of monkeys. The image of e Alpha monkey hissing his fangs n refusing his leave, comin fwd to try attackin my husband is still so vivid. Families w kiddos do take note. I wished i ve e video n ull understand how aggressive they can be. I loved our stay at this resort. We also stayed at the St. Regis, and I liked the more casual feel of Samabe. The grounds were beautiful with lots of flowers, greenery, and even a pond with ducks. It was a nice size, not too big or small. We stayed in a suite with private pool and ocean view, and it was one of the best rooms I?? ?ve ever stayed in. We met the general manager and he was really nice. We received amazing service from Kris at the front desk, and she arranged a special dinner for our anniversary. Cynthia allowed us to have a late checkout, which was much appreciated. Unfortunately, the food was my least favourite of all three resorts we stayed at. It wasn?? ?t terrible, but there is certainly room for improvement. Also, the gym?? ?s air conditioner needs to be fixed. But the beach was nice, and so was the pool. We enjoyed standup paddle boarding. We didn?? ?t go for the all-inclusive package, and we were happy with our decision.